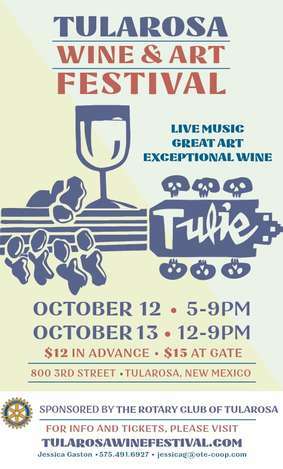 Join the Rotary Club of Tularosa for its 14th annual Tularosa Wine and Art Festival! We'll celebrate New Mexico's finest wines and the work of local artists, backed by tunes by local musicians in the shade of towering cottonwoods, at the historic Iglesia St. Francis in the original Tularosa townsite. There will be many vendors on hand, most presenting hand-made and local arts and crafts for sale. This year, the festival will run from 5 to 9 PM on 12 October, and noon to 9 PM on 13 October. The festival gate is at the corner of Encino Street and 3rd Street, on the east side of US Highway 54/70 in Tularosa. Parking is free. Ticket is good for one adult admission, one day only. You must be 21+ years of age to purchase a ticket. Admission is free for children 21 and under but they must be accompanied by a parent or legal guardian.The Rotary Club of Tularosa, the only service club in the area, returns all profits from the festival directly to the community. Tickets will be $15.00 at the gate, so take advantage of the online savings!